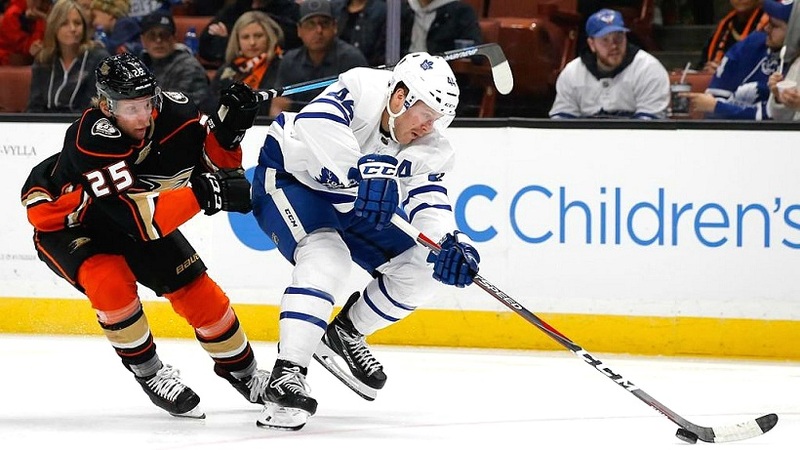 TORONTO (Nov. 19) — Yes, we all understood, by the quarter–mark of the National Hockey League schedule, that the Maple Leafs would likely be in a points dogfight with Tampa Bay and Boston near the top of the Atlantic Division. Which has materialized. What virtually none of us anticipated was a five–team race for bragging rights in the division; that Buffalo and Montreal would be smack in the picture… and that the Sabres, on Nov. 19, would lead the Bruins by a point. Put your hand in the air if you predicted this. Now, put it down… liar. The Leafs — while playing without Auston Matthews since Oct. 27 and William Nylander since Day 1 — deserve abundant credit for their third–place ranking in the overall NHL standings with 28 points, one behind T–Bay and Nashville. And, for tying the Lightning and Predators with a league–best 14 victories. Every Toronto conquest thus far has been a coveted ROW (regulation or overtime wins): the first tie–breaking stat among teams that finish with identical point totals. Shootouts (thankfully) are excluded from this category; neither have the Leafs been involved in one this season. But, Toronto isn’t alone in the injury (or AWOL) department. Tampa Bay, right now, is toiling without its No. 1 goalie, Andrei Vasilevskiy (4–6 weeks with a foot–fracture). Defending Norris Trophy–winner Victor Hedman missed seven games (Oct. 27 to Nov. 9) with a concussion. And, fellow defenseman Anton Stralman is “day–to–day” (UBI), having missed the past four matches. In Boston, Zdeno Chara (leg) and Patrice Bergeron (UBI) are banged up. Montreal has been without its top defenseman, Shea Weber (knee surgery), all season. Only Buffalo is close to full strength (and wasn’t it a year ago around this time that pundits began to wonder if Phil Housley could coach in the NHL?). Shake it all out and we’ve got a dandy first–quarter pileup in the Atlantic. Heading into tonight’s games (the Maple Leafs host Columbus), the top five teams in the division have all played 20 matches and are parted by a mere four points: Tampa Bay 29; Toronto 28; Buffalo 26; Boston and Montreal 25. Sixth–place Ottawa (21) is only four back of the Bruins and Canadiens. We figure some obvious separation will occur, but many anticipated the Atlantic to be a bit–more defined at the quarter–pole. Instead, and after 20 games, the division is entirely up for grabs. Given the relative parity of the NHL in the salary–cap era, the magnitude of a division title in the regular season is debatable. It earns a team home–ice advantage (if there is such a thing) in the opening playoff round against one of two Conference wild card opponents. The second and third–place teams automatically qualify and match up in the first round — the higher–ranked club starting at home. So, two of the current Top 5 in the Atlantic will need to be in the wild card hunt. As it stands, a particularly good team could easily miss the playoffs. Even a semi–lengthy slump may therefore be costly. As of now, it doesn’t appear as if the Maple Leafs — or their division opponents — will be able to “relax” at any point in the schedule. Which brings me around to my biggest concern with the Maple Leafs; and I’ve written about it on several occasions — the over–exertion of starting goalie Frederik Andersen. Evidence, thus far, indicates that Mike Babcock is again erring rather grievously by having the Big Dane on pace to start 60 to 65 games. When doing so last season, Andersen undeniably ran out of gas. It was apparent through the final six weeks of the regular schedule… and it came to roost during an unsightly performance at Boston in Game 7 of the playoffs. Still, the coach is undeterred; obviously considering last year to be an anomaly. Maybe Babcock is rolling the dice correctly this time, but we won’t know until April. The way I view it, he is gambling. Big time. If the coach is riding Andersen for the purpose outlined in this blog — to ensure the highest–possible berth in the Atlantic Division — then it’s understandable. We must, however, also factor in Albert Einstein’s famous definition of insanity: doing the same thing over again and expecting a different result. Such is the balancing act Babcock has chosen to ignore… even though his best NHL years in Detroit featured the sharing of games among two goaltenders, thereby allowing Chris Osgood to remain fresh for the long playoff runs of 2008 and 2009 (the Red Wings beat Pittsburgh in the Cup final the first year; then lost in seven the next). As mentioned, time will determine whether Andersen has more in the tank next April. It does appear, however, that the Atlantic Division will evolve into more than the anticipated three–team battle.